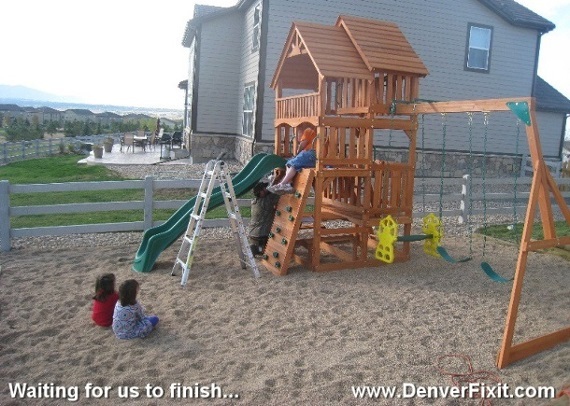 DenverFixit.com - Swing set & Play Set Installations, Assemblies and Moves. Serving the Denver Metro area. Relocations of Backyard Adventures, Rainbow, Backyard Factory, Tree Frogs playsets, swingsets, Deliveries and More! 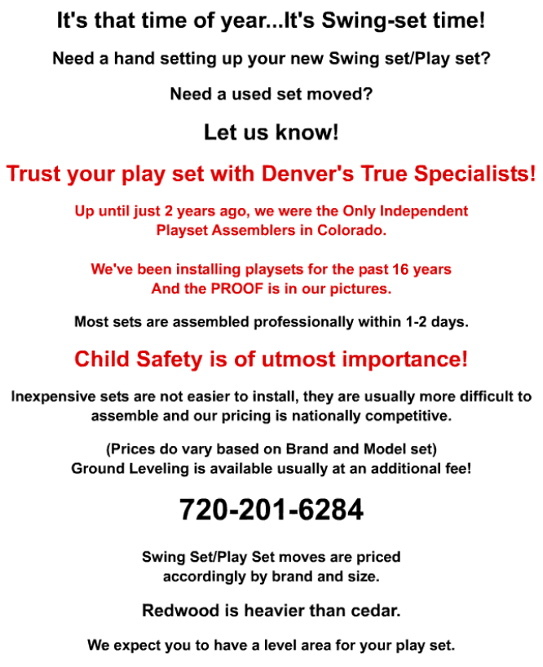 Colorado's #1 Swing Set / Play Set Installers and Relocators!! see page bottom or click here. The proof is in the pictures!! But we have many happy references as well! Call, Email or Text for Pricing. Don't let the word "Assembly" fool you. A play set assembly is more a construction job. A carpentry background is necessary. And in some cases beat it! After all, they get their pricing by seeing our's first. We SHOW our pricing because we have Nothing to Hide! No tricky salesmen to trap you on the phone. $350 move + the dog poop charge! Had to remove a lot of bees! Added A LOT of time. Click here to view 2015 Play set moves and assemblies! Used swing set/play set moves also available!! Rainbow Play Sets are a lot bigger and heavier than other sets and are priced competitively with Rainbow Quotes..
"The Fort" seldom can be broken down to less than its main structure based on its construction. If we were to completely disassemble a set, why would we not charge double to re-assemble it? Used sets are usually heavier than out of the box sets. People usually sell the heavier used sets online including Swing Kingdom, Rainbow, Backyard Adventures, Backyard factory, etc. The minimum amount for these set moves is usually $600 locally, but can easily get to $900 and higher. The minimum for a smaller/lighter used set move such as a Costco, Toys R Us, Sam's Club, etc. are $550 and up. Additional fees from ground leveling! Additional fees may also come as a result of travel time as well as gas. When looking at a used set, if the floorboards of the fort are 1/2 an inch thick - it's a lighter set. If the floor boards are an inch + in thickness - the set is built for heavier / older children and requires 4 people. Check the bottom beams for any rotten wood. Don't be afraid to climb a used playset and feel around...if it's safe for you, it's certainly safe for your kids! Too many misquotes have happened so all future play set moves will require a site visit prior to quoting. Yard layouts, fences, gates etc are all very important when knowing how easily a set can be moved. If you are not local to Denver, site visits will not be made and you can expect a higher quote. The inexpensive sets require ground stabilization, the pricier ones do not. doesn't necessarily mean it's less money to assemble. More often they are a lot harder to assemble than a pricier set so the assembly rates can often be very similar. Swingset Assembly/Installation Costs vary based upon size and structure of the set.